Yes, I had a little list of cards to make this weekend! I wanted to send a card out to some friends (just to say Hi, I Miss You), as well as make two baby cards (one for a girl, and one for a boy -- my friends have been busy hehe). 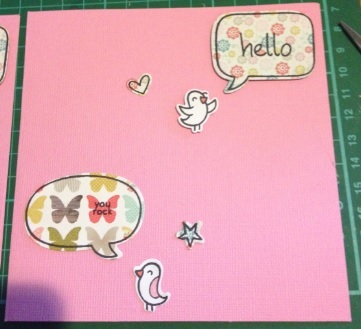 Next was another 'Hello' card, utilising papers and accessories from the Dear Lizzy '5th & Frolic' collection. 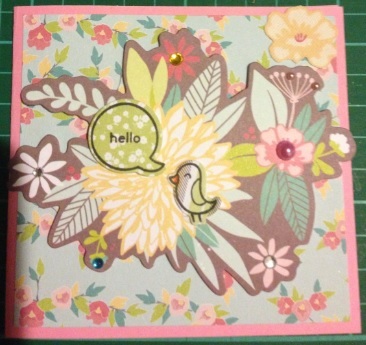 Again, pink textured card, '5th & Frolic' paper, chip-board floral, fabric floral, Lawn Fawn stamps and die, black ink, multi-coloured rhinestones and pink pearls. Surprise surprise I stuck to simple designs for the baby cards too. 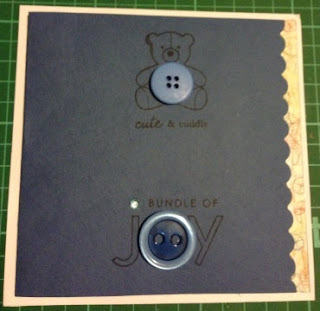 For the baby boy (Blake :) )I used navy/deep blue card (which didn't photograph that well), PTI stamps, black ink, blue buttons, and a blue rhinestone. At the last minute I decided to scallop the opening edge, and add some patterned paper to the inside. 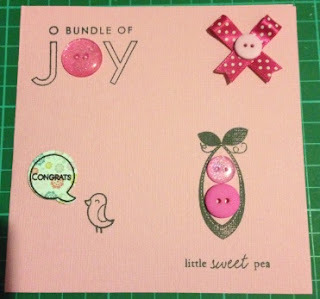 Girl card (for Amelia :) ): pink textured card, PTI stamps, pink and white dot ribbon, pink buttons, Lawn Fawn stamps and die, and black ink.